Imagine Your Future UFV Library Chilliwack--March 30, 10:30 a.m. to 1:30 p.m.
Stop by the hallway outside the Chilliwack library today until 1:30 p.m. March 30 and tell us about your future library. What kinds of spaces are you using? What are you doing while you’re there? 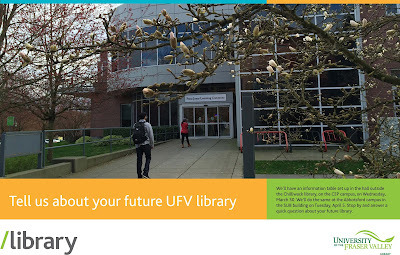 UFV library will be asking you how you will use your library of the future. Our information tables will be outside the Chilliwack library in A building on March 30, 2016 from 10:30 am to 1:30 pm and in the Student Union building on the Abbotsford campus on April 5, 2016 between 10 am and 3 pm. Stop by for a treat and answer one quick question that will help propel the library toward UFV 2025. Help shape your future library! Chilliwack library student computers, printing, Internet and other systems have been restored. Chilliwack campus library student computers and other systems not working. We'll update as soon as possible. What is your future Library? As part of the overall modernization and consolidation of ProQuest ebook platforms, the ProQuest EBL platform will be unavailable for up to two hours Thursday April 7, 2016 for scheduled maintenance. 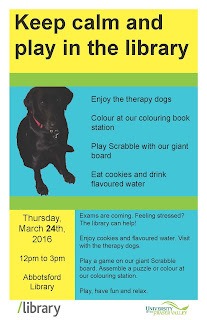 Join the UFV Abbotsford Library for a fun event on Thursday, March 24th! 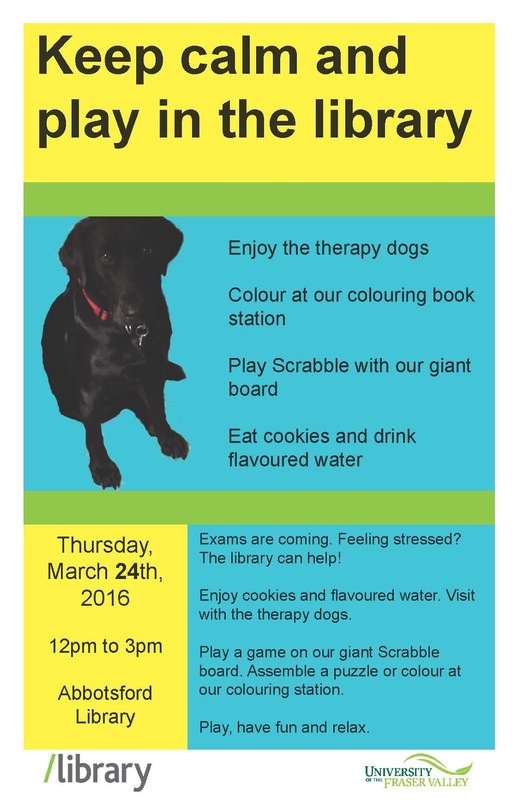 Between noon and 3PM we will have therapy dogs, colouring stations, a giant scrabble board, Easter eggs, cookies, and drinks. Don't let late-semester stress get the better of you. Come and mix with your fellow students and library staff. 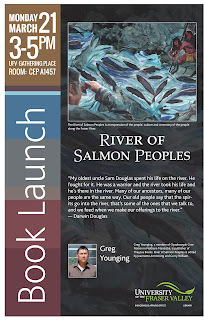 Theytus publisher Greg Younging will be in Chilliwack on March 21 from 3 to 5 p.m. to launch the book “River of the Salmon Peoples." This book, edited by Jeannette Armstong from Penticton, and Gerry William from Spalumcheen, shares voices from Seabird Island and Stó:lō Nation, including Corky Douglas, Roza Roberts, Arnold Ritchie, Carrie-Lyn Victor, Wenona Victor, Ernie Victor, Darwin Douglas, Mel Bailey and Wendy Ritchie to name a few. 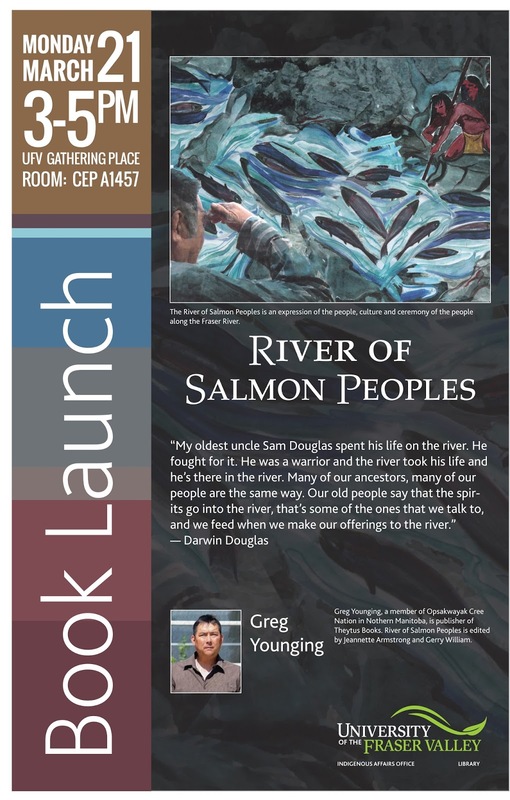 Come out to the UFV Canada Education Park Aboriginal Gathering Place, enjoy some from refreshments, and celebrate the launch of this book. Please invite family and friends and circulate widely. This event is hosted by UFV Indigenous Affairs Office and UFV Library. For more information please email: Shirley Hardman shirley.hardman@ufv.ca or Heather Compeau heather.compeau@ufv.ca. Do you feel the tension building in your shoulders? Do you have a strong desire to eat an entire bag of potato chips? Midterm anxiety getting you down? It's time to take a break! 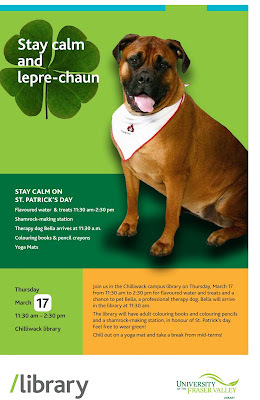 Stop by the Chilliwack campus library for a de-stressing event on Thursday, March 17. We'll be going with the St. Patrick's Day theme by hosting a Shamrock-making station. Other stress-busting activities include a yoga station, adult colouring books, and therapy dog Bella, who will arrive at 11:30 a.m.
We'll also have flavoured water and treats between 11:30 a.m. and 2:30 p.m.